We congratulate 15-year-old Tyler Rico on his recent victory at the Nevada Regional High Power Rifle Championship held on February 13, 2010. Rico scored an impressive 791-26X, securing the overall “Open Winner” match rifle championship. Tyler also won the High Master Class and NRA Junior Class titles at the recent Boulder City, NV event. This NRA-sanctioned match, held at the Boulder Rifle and Pistol Club, is one of many regionals conducted throughout the year. High Power shooters can also compete in the National Championships held each summer at Camp Perry in Port Clinton, Ohio. Rico secured his win by completing the four-stage course of fire that included 20 shots standing at 200 yards; 20 shots sitting at 200 yards; 20 shots from the prone position at 300 yards; and 20 shots from the prone position at 600 yards. Rico, age 15, is a former Junior National High Power Rifle Champion. 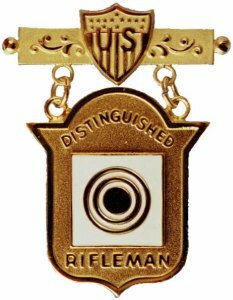 Tyler is also the youngest-ever recipient of the Distinguished Rifle Badge, which he received at the 2007 National Matches. Tyler and his father, Cecil Rico, joined the Remington High-Power Rifle Team in October 2009, and reside in Tucson, Arizona. Share the post "Teen Tyler Rico Wins NV High Power Championship"
Share the post "Biathlon Enhanced — Hollywood Action-Movie Style"
It’s time to get ready for the 5th Annual Shilen Swap Meet. Rain or shine, the Swap Meet will be held from 8:00 am to 3:00 pm on Saturday, March 20th, in the Shilen parking lot (Ennis, TX). The event is open to “all comers” — both buyers and sellers. Anyone can set up a table or just back their truck up and drop their tailgate. There are NO FEEs or costs. And there will be FREE FOOD –complementary chili, frito pie and water, tea, or coffee. Shilen’s ‘Swap Meet Barrels’ will be BACK. These are first-quality barrels built for customers who requested a specific contour, twist rate, or caliber, but later changed their minds. Shilen let these customers modify their orders, but some of these custom-ordered barrels remain in inventory. These pre-ordered “orphan” barrels will be sold at deeply discounted prices at the Swap Meet. NOTE: All warranties still apply; these are NOT lower quality or factory seconds. Factory Tours will be given again in 2010. During the morning tours — 8:00 am until 11:00 am — the drill, ream and rifle machine will run. Tours will continue in the afternoon but no machines will run then. 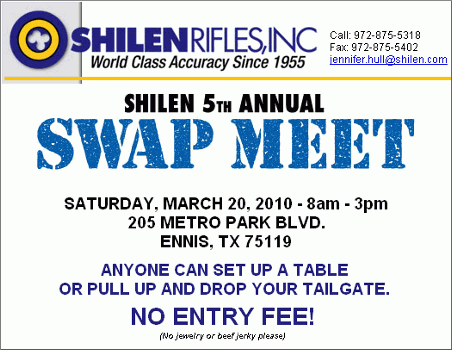 Share the post "5th Annual Shilen Swap Meet Coming Soon"